Visitors arriving from the North and East are advised to use the M3 or A34, then the A30 through Stockbridge or the A303/A343. Turn right just after the Pheasant Hotel. From the West and from Salisbury, take the A338 and turn east in Porton village. Porton Down, DSTL is well sign-posted. It shares its approach road with the HPA (Health Protection Agency). From the approach road, turn right into Bybrook Road. Porton Science Park building is then on the left side. From the approach road, turn right into Bybrook Road. Porton Science Park building is then on the left side. Visitors arriving by Train may, by prior arrangement, request a Courtesy Car for collection and delivery at Salisbury station. The station is about 15 minutes from the Science Park by road. 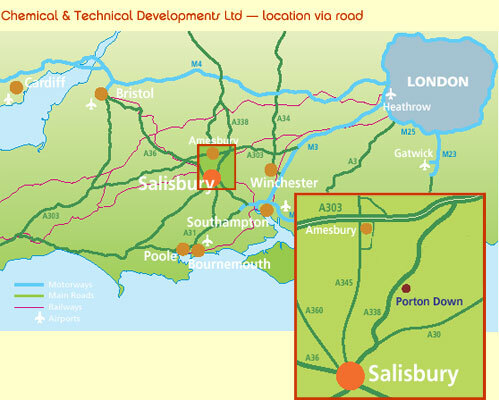 CTD, Porton Down is less than two hours drive from Heathrow and Gatwick Airports, 45 minutes from Southampton Airport and about one hour from Bournemouth Airport. There are no convenient rail connections from the airports to Porton Down. Visitors to the Porton Science Park are only seen by appointment.